A video of a woman pickpocketing has been circulating online with a message alleging that the incident happened at Ghim Moh market. Several Stompers alerted Stomp to the video via WhatsApp and Facebook. 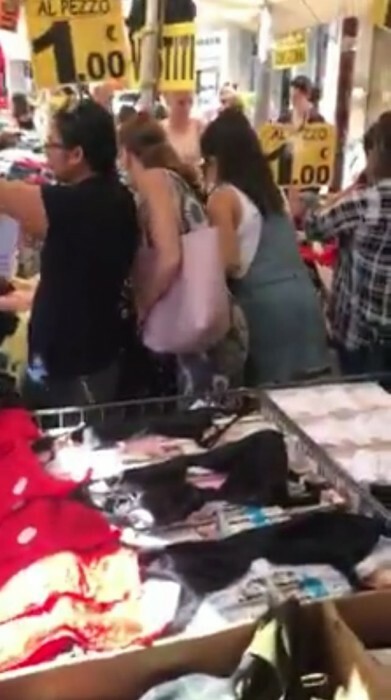 In the video, a woman wearing spectacles and a pink bag is seen standing extremely close to another lady who does not seem to take notice as the market is busy and bustling with many people. Within the span of the 16-second video, the woman with the pink bag manages to extract a wallet out of the other woman's sling bag and walk away without getting caught. Some eagle-eyed members of Stomp's Facebook group were quick to point out that the incident could not have happened in Singapore as the price signs show a symbol for the euro instead of a dollar sign. "Fake news. It's not in Singapore. I believe Singapore markets don't label the prices in Italian." Indeed, written on some of the signs are the words, "al pezzo" which is Italian for "per piece". This is yet another reminder to ask questions and make checks before believing any fake news circulating on the Internet. Geylang Bazaar stall owner accused of selling 'plastic' keropok: It's just $2 for 7, why would we put plastic in?